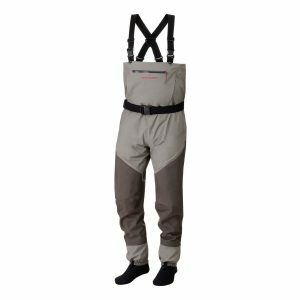 The Redington Sonic Pro are stocking foot chest waders made from breathable fabric and with costs from 250$ to 300$ almost in the upper price range. Buyers ratings on several online shops are promising a high-quality product and the brand Redington certainly has a name in the scene. In this review I will show you, what you get for your money. I ordered this pair from an online shop, where it was on sale in a “Today’s Deal” for a little over 250$. When I held this pair in my hands for the first time I was honestly impressed, my first impression was: you definitely get something for your money here. The used fabric is four times layered nylon, which is pretty common for breathable waders and served me well in other pairs before. I did not sweat or freeze wearing them, the breathable material works as intended. Although I have to test the durability in the long run, but it definitely feels like a sturdy piece of equipment. That being said, thanks to the sound welding, the weight of the product is surprisingly low and therefore perfect if your usual routine includes longer hikes to fishing spots. Folded up tight they would also take relatively little space in your backpack. The seams are welded together and not sewed, which is the normal process. What sounds odd first is actually a pretty neat technology. The edges of the fabric do not overlap but the adjacent pieces are sonically welded together. By the way, the patent for this technology is owned by Orvis. You do not have to be sceptic here, I myself used waders with welded seams before and in terms of longevity, you won’t notice a difference. Additionally, they come with reinforced knees to make them even more durable. We all know which area takes the most beating. I am, what you would call, from an awfully average build and Redington’s always fit me very well. This is also the case for the Sonic Pros. I felt instantly comfortable wearing them they did not imped my flexibility at all and if you close your eyes, you would almost not notice that you are wearing a pair of waders! My testing always involves at least one trip to the local river. While I always update if feel like wearing the pair a little longer, this time I actually used them for several days of fishing already. They became my new “everyday-waders” for the last couple of weeks. As stated earlier there is really nothing to complain about, they claim they are breathable and yes, they actually do breath. Even after a few miles of hiking, I didn’t sweat more than I would in a regular pair of pants. Standing in the river they provide decen insulation and with a pair of thermals underneath, I would totally wear them during the winter months. I didn’t encounter any leaks of flaws in design yet and I do not expect to either. For that price, they are definitely a pair worth spending your money on. A wading belt is a must as soon as you enter the water, we do not have to argue about that. Here we have belt included which is even flexible. I am used to belts that you can not stretch at all which can get really uncomfortable during long fishing sessions. A flexible belt is easier adjustable and the three attached belt loops hold it in place as intended. I am always please when my waders have handwarmer pockets. The Redington Sonic Pro come with not only these but also with a decently sized exterior pocket which will easily fit a small box of flies. Another awesome feature is the flip-out interior pocket which includes a small opening to store your clippers. With all these combined the Sonics certainly offer enough storage possibilities and you might even want to leave your fly fishing chest pack at home. Gravel guards are included and fit as tight as they supposed to be making it hard for any unwanted objects to enter your wading boots. I found the Lace hooks, that you attach to your boots, perfectly crafted and did not have to reattach them once in the water. I honestly can not come up with any arguments against them! 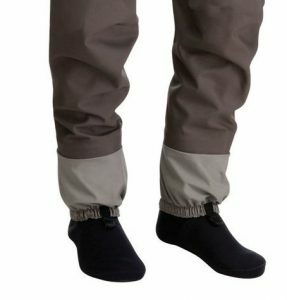 I had the chance to test the Redington Sonic Pro on several fishing days now and they became one of my favourite pair of waders. Since they are so comfortable you tend to forget that you even wear them, letting you fully concentrate on fishing and that is what it should be about. What you get here is a high-end product for a relatively cheap price and even for 100$ more, I would still consider them to be fairly priced. No matter what you plan on with them you can not go wrong here. Redington also offers a zipper-front version, if you are interested in that one, I recommend checking out FinFollowers review here. 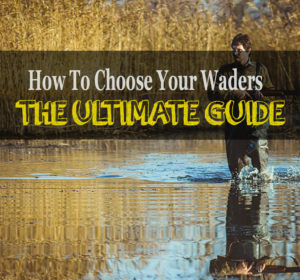 I own them myself and honestly, the best waders I ever used. Not too expensive and top-notch quality. Once they break I will probably get them again. Would you prefer that one over the zipper-front version? The zipper-front version seems to be a good alternative. I just linked a review from FinFollower beneath ours, apparently they are a decent alternative, but read yourself!